Although most southern commuters’ first experience of the New Network for South Auckland was on Monday morning, the go-live was on the day before – Sunday – when travel demand is much lower and any issues can be ironed out before the masses crowd on. To see what it was like, I decided to take a transit journey down south and experience first-hand the sort of the change the network might (or might not!) bring. 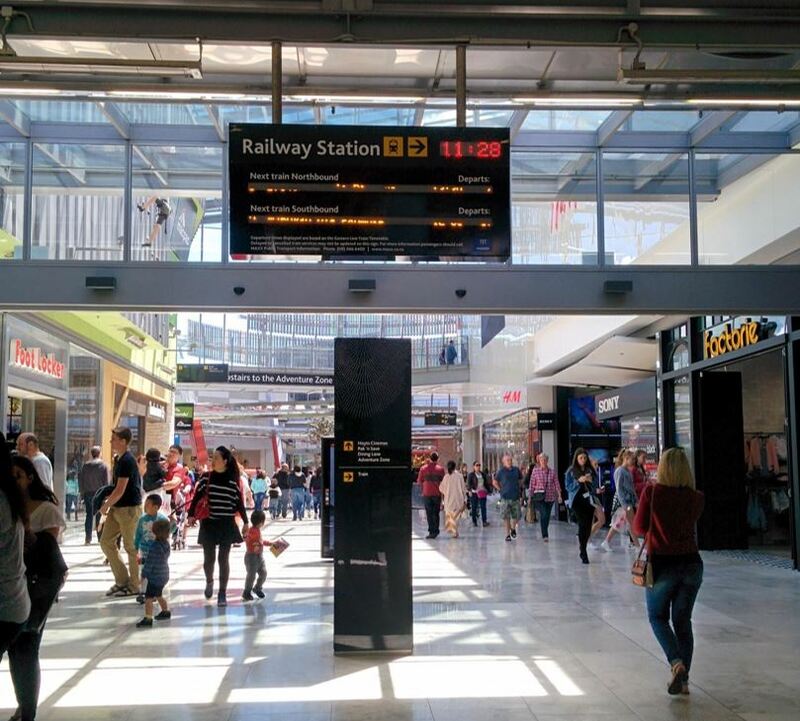 I took a look at the network map online, and decided to start my journey at Britomart, travelling to Mangere, Otahuhu Town Centre and finally Sylvia Park before returning to Britomart. Leave in the morning, and be back by lunch. Spaghetti, yes: and the chef was quite possibly drunk and suffering from anger issues. That map is convoluted enough to make me give up and not even try – how are you meant to figure out which one of those maroon coloured lines to take, for instance? Otahuhu Station is greyed out to indicate that it’s purely a transfer: I don’t care about shopping there, I’m only getting off the train to take a connecting bus to Mangere. not on a Sunday or in fact a weekday except during peak hours – you’d spend all day waiting for infrequent services to turn up. But the New Network says this should now be possible in reasonable time and minimal frustration, so why not see if it holds up? Starting outside Britomart, the first task was to find a paper map and timetable. This was easy enough, and once obtained I looked for the first train that’d take me to Otahuhu Station. Luckily Otahuhu is served by both the Southern and Eastern lines, so the individual (entirely inadequate) half-hourly frequencies combine to give a train on average every 15 minutes – which while not exactly great – is serviceable. After waiting at the platform for 4 minutes, I took the 9.58 service (on time), and arrived at Otahuhu at 10.24. 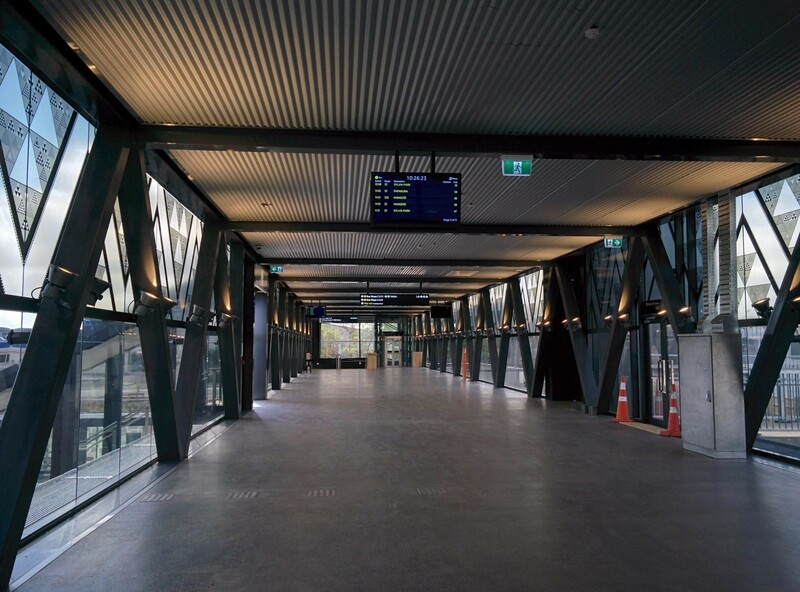 The new Otahuhu Station is fantastic. Somehow, It even smells like transit. Maybe ozone from the overhead lines is seeping into the building. There’s quality wayfinding in place, much like you’d see in better stations in cities overseas, with exits and platforms clearly marked. There is real time information in the concourse as you transfer, but unfortunately it wasn’t showing the platform for each service. Instead of looking around I took the easy option and asked an AT person with a clipboard where to get my connecting bus. It’s great they’re using what look like fairly standard sized and reasonably large LCDs. But in my opinion they don’t show quite enough services at once before they resort to paging: waiting for it to scroll around to the screen that interests you can be at best annoying and at worst bus-miss-inducing. On a normal trip I’d use my phone to get this info instead. The primary job of an interchange is to get passengers from one service to another with maximum speed and minimum anxiety, and given that the entire network just got replaced and everything is brand new, it did this with reasonable competence. A bit of tweaking to the wayfinding and it could be excellent. I found my platform and a 325 turned up after 5 minutes. I had the option of a 32, 324, 325 or even 326 here, which combine to give average 6 minute frequency. The bus trip was on a brand-new vehicle, with USB at every second seat (in fact all buses I rode were similar). There were unfinished bits though – like missing screens which I’m hoping at some point will display your position on the route. 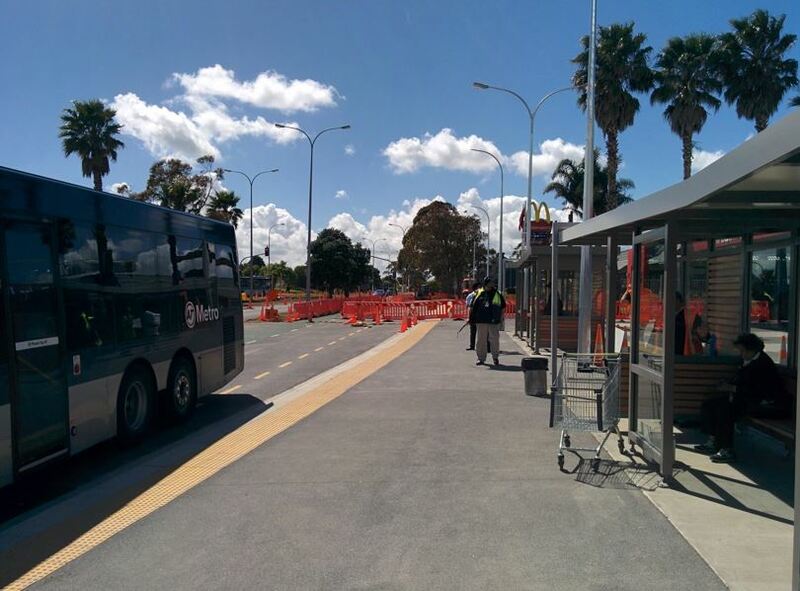 The bus arrived at the Mangere bus station after a short trip. Since Mangere was a shopping stop, I wandered off to look around for a while. The station clearly isn’t quite finished yet: it’s basically a cone farm. I didn’t see any obvious sign of any cycleways yet either, but I did see a child on a BMX trying to wend his way through the construction. Hopefully it gets finished soon. Mangere is home to one of the new bus shelter designs that were trialled on Symonds St. This one felt a bit more robust than the one that was demoed and was pretty comfortable to be in, at least on a good day. I’m still a bit doubtful about how well it will hold up to wind and rain, though. Despite there being some pretty decent maps and timetables displayed in the stops, practically every passenger who came through asked AT staff for help. My impression is that they’ll need staff on hand at all the major stops for quite a bit after launch. I overheard a few conversations, and while many were understanding of the changes and the need to transfer, one person neatly summed up their concerns with, “but nothing ever works properly in Auckland”. When I got sick of shopping I started looking for my next bus, which was a 32, and turned up after 5 minutes. So far I’d managed to do all this without looking at an actual timetable at all – only maps – something which would’ve been inconceivable on Sunday, only a week before. But unfortunately it isn’t completed yet so it’s less clear when to get off. Thankfully the bus driver saved me and let me off at the right place. After wandering the town centre for a bit I finally found my unique-to-the-region produce and went looking for the bus to Sylvia Park. In hindsight, it’s obvious that I should’ve just got back on the same service at the same stop I got off on… but being an idiot, I instead headed directly for where the old Otahuhu bus station used to be, where I found a large number of very confused people. The AT staff were pretty busy helping people who genuinely needed it but when I started trying to clamber through the construction site across the road someone showed me where I actually wanted to go. But to be fair on me, the wayfinding here was pretty poor: if you’re going to require people to go to an unexpected place to catch their bus, then you need big signs with giant arrows all the way to the destination, not the little bits of A4 they had taped to the bus shelter. Having people to help is great (and they were great – watched one guy manage to get a couple with zero English on the right bus), but never underestimate the value of giant arrows in times like this. Due to the combination of me screwing up and lack of good temporary wayfinding I missed my bus, so had to wait 15 minutes for the next. Which would’ve been fine, had it turned up. In reality, and in true Auckland fashion, it didn’t. So I waited about half an hour until one did, which was the 32 to Sylvia Park. As I wandered from the bus stop through the mall to the Japan Mart (source of all the instant ramen you could possibly want) to do my final bit of shopping, the real-time train info handily displayed in the mall let me know that the next service to Britomart would be leaving in 7 minutes. This was simultaneously useful and disappointing: useful because I now knew I only had 7 minutes to get to my train, which isn’t much time; disappointing because now I had a choice between either cutting my shopping short (I genuinely wanted to spend more time there) or shopping a bit longer and waiting almost half an hour for the next train. Possibly the most interesting thing about this journey was that I could do it at all. It’s was little extreme, and you’re not likely to want to do such a thing often, but until Sunday it was impossible or at least wildly impractical to do with public transport – and now it isn’t. We’re taking a big step forward. But how about the details? How did the network stack up against the constraints I set at the beginning? I didn’t use a phone at all for planning, nor did I choose my start time based on timetables, it was just when I happened to get up. I was surprised how legible the network was; I never really missed having my phone – in fact it was freeing not having to constantly ask Google how to get somewhere. Planning the trip felt similar to planning a journey on a reasonably decent transit network somewhere in Europe. I did miss having on-demand real time tracking a bit – it helps make you feel more in charge of your journey (do I bail and call a taxi, or stick it out?) – but the only time I really felt I needed it was when the 32 bus from Otahuhu Town Centre didn’t turn up for half an hour. When services are frequent and reliably so, you don’t really need real time. Sadly, I don’t think we’re quite there yet in Auckland, even on our frequent routes, so this will probably remain essential for quite a while. This is a derivative of frequency and reliability: are things good enough that I can ride somewhere, wander off and not worry about when I have to leave to catch a service? Despite the hiccup with the 32 I felt I could – but only if the journey didn’t involve rail. It seems to me that the biggest weakness with the network will be the poor off-peak rail frequencies. AT need to look into getting them to serviceable levels as soon as possible. To me, that means every 10 minutes, but no doubt others have different opinions. I’d just like something that’d allow me to get my noodles, and not be forced to hang around in a mall for ages if I decide on a whim to buy cake as well. You should try getting off at manurewa and transferring to the feeder buses there. Monday morning ok. Bus driver got lost. Monday pm. All bus late, 33 services moved to train station bus interchange. Not enough shelter, 2/3 people outside. General confusion told by AT help helper person buses had been running late all day. Lots of buses to the gardens (5 in 20 minutes… Bus drivers were confused why there were so many). Wattle downs bus 25 minutes late … A lot of confused and annoyed people. Driver missed some stops. Yeah there’s still so many hourly buses, it’s luck of the draw if you train to Papakura expecting to get 373 or similar. It’s alright on the return because you can just time leaving with the bus, but coming from city you have to get the right train. Painful. 3 Try and take a relative view: PT wasn’t perfect before, and they won’t be perfect after. Key thing is: Are things getting better? I would say that we need to wait 6-18 months before forming a firm view on how things are working. Of course, you’d hope basic operational issues were sorted within 3 months. Quieter PT in general due students are starting to go on study break / exams from what I can tell? Jeez, it’s barely been 2 days! Just as well you didn’t need the lift at Sylvia Park station. The AT Vogons have closed it for 3 weeks! How can it take 3 weeks to maintain or repair a lift? If it took 3 days it would be slow. It took three months to do the Papakura ones earlier this year. You’re lucky you don’t work in my building downtown. We’re lucky if we can have the lift in service for three weeks at a stretch. Ha, that lift seems to be constantly out of service – I swear it was out for months on end a year or two ago. Thanks Patrick. Despite the teething problems, I think the NN’s going to be a fantastic change. Seeing those single digit arrival times on the displays in Otahuhu on Sunday was very encouraging. I wouldn’t use a smartphone. Bought a cellphone in 1995, gave it up in 1998, and never looked back. I’m often amazed at how many people say they couldn’t live without one, yet I don’t feel I’m missing anything at all. 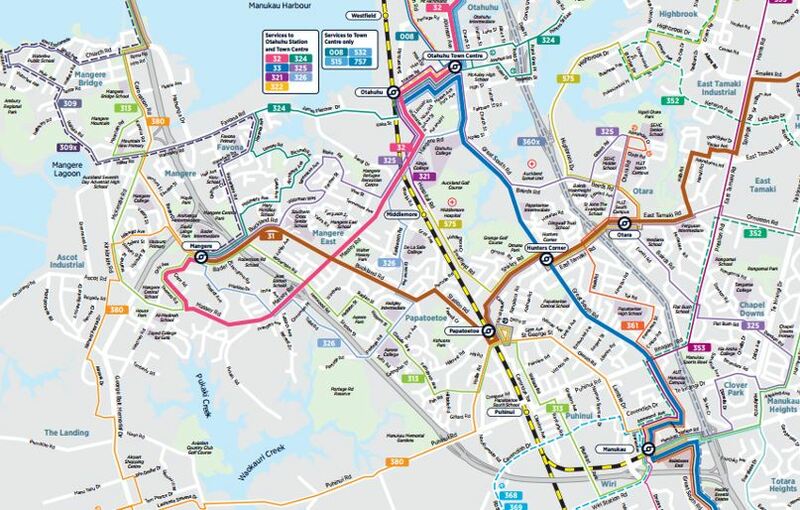 Looking at that old spaghetti map with 4-6 different route numbers running along the same streets it’s pretty conclusive that the new network for South Auckland is simpler and easier to understand without yet riding on it. My only criticism of the new map style is the thin lines of the less frequent routes are TOO thin and light, but hard to see ? PDF or paper versions included. Older people will struggle. Agree about the lines – I think they might need to be a touch more visible. Nice review! Useful to know. I’ll give the bus a try in a few years once they figure out how to stop buses from magically disappearing and not showing up. Yes nice review. Re disappearing buses. We experienced this & I heard an ambassador mention complaints about it: Sunday Sylvia Park hourly replacement 515 bus didn’t turn up at least a couple of times! Is it when missing driver due to unexpected sickness or day off and they can’t alter electronic or online schedule? I observed when estimated time doesn’t show then it vanishes off schedule after next scheduled one starts? Once services pass the scheduled time without a tracked due time they drop off the PIDS. Food for thought – Perhaps in addition to ETA scheduled arrival times, an additional new system could be trialled with bus/train numbers and the approximate distance instead? somehow with NFC or Bluetooth attached to the bus/train and the station so they sync to each other at each point? I’ve always found approximate distance a reliable factor, if ETA changes but distance to station hasn’t changed then it’s a good way to judge a bus/train hasn’t moved from it’s last approximate locale. 99% NFC/Bluetooth have nothing to do with that. The trains and buses are equipped with GPS which is how you know how far away they are. Track My Bus app does that….though it doesn’t show estimated time which I think could be combined into one screen. * Agree wholeheartedly about the displays at Otahuhu Station: where there are five pages to cycle through it takes an extraordinarily long time to wait for “your” bus to show up if it’s several screens away. IIRC, when the new bus shelters were trialled on Symonds St, the displays there showed a few of the most imminent departures “fixed” on the screen while the remaining departures on display scrolled continuously. Much preferable, in my view. * By far the worst aspect from my point of view was the quality of the display timetable information at bus stops large and small. I think they have allowed the “turn up and go” philosophy to dictate a format which is for many routes very unclear, especially on non-frequent routes. The type size is very small, and you have to read the small print to find that services operate at (say) 8.43, 8.58, 9.13, 9.43 and then approximately [VERY LARGE TYPE] 30 [end of very large type] minutes until 14.39, 14.55 etc. It requires a bit of thought power to work out that, yes, there will be a service at 13.13, where it should be obvious. Add to that the fact that many of the timetables fit into just a corner of the page size available, and there are large areas of white space on the rest of the page. I don’t for the life of me understand why they can’t increase the size of the printed material to “fit the page”. This way, I’d be able to instantly see what time my bus is likely to appear rather than having to calculate it. Yeah the display pages are annoying, surely 99% people will only be looking at the first page since its an interchange. People don’t have time to wait for 5 pages to scroll they could miss their service. The few people who want to see services further in the day would have time to check the app or paper timetable. Also the ones upstairs should have the platform letters next to the service. Perhaps the team working on the displays aren’t regular PT users? The paging thing is the sort of thing that is obvious to regular users but probably not at all to others. It would be good if they could do a review of them – Otahuhu station is so close to be excellent with a few little things holding it back. Yes agree, time to overhaul the PID system to suit the new network model. Reckon it should be one line per route, with how many minutes away the next three or four departures are. One line per arrival gives you that crap of five pages of individual runs cycling through all sorts of stuff over the next hour or two. Yes they have just kept the old more rigid scrolling format I guess because it’s more familiar / the same as the others. you just go to double check you looked at the right line and it scrolls….or you don’t’ and end up catching the wrong bus/train. I’ve seen that hour / minutes style timetable in Germany, it’s pretty easy and fast to read. 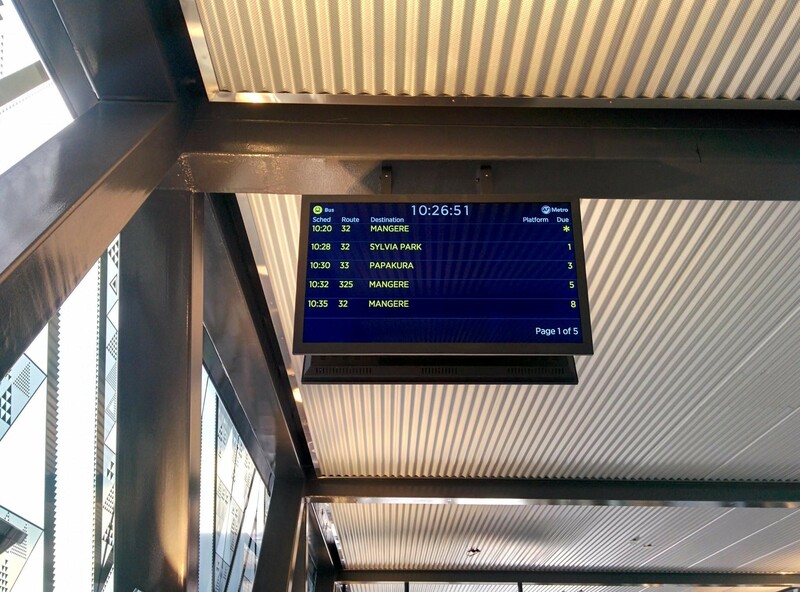 And those time displays, a possible improvement is to only show the next service for any given line (or destination). Or maybe the next two ones. This gets silly on the Northern busway, if you know there’s going to be a NEX at 9:00 and 9:05, is it really useful to know there will be another one at 9:10, 9:15 and 9:20? Yes 32 to Sylvia Park page 5, 111 minutes away. Who cares. We also use this format in Melbourne, for buses. David and Roeland. Agree, this style of timetable presentation is a clear improvement. It’s been used in NZ before, too – when I was a student in Christchurch in the 1970s that was how the (then) CTB network presented its timetables. Seems so simple and clear – perhaps that’s the problem! There’s a difference between the format they use at stops vs. on paper. E.g. The paper ones seem closer to what you’re both describing; at the very least, I don’t have trouble understanding them. But the one at the stop I had trouble with. And as Stephen D mentioned on twitter, “approx every 30 minutes” is not very helpful. Yes, and only 2 lines worth it appears. That third image is really important — the map clearly shows which services are frequent. That alone makes the difference between just getting around with a map, or spending half an hour wading through timetables. I think that’s also a reason why the LINK buses are so popular. You can rely on every line on that map being frequent. Minor style point, IMO you way overstate how “unusual” those constraints are. It should take an outrageous amount of time. People go shopping around on Sunday. And not everyone has a smartphone. To me these look like pretty elementary requirements, and anyone driving a car will take those for granted. It’s quite impressive you actually pulled it off. I wouldn’t even try with only one destination, from the CBD on a Sunday I could barely make it to Newmarket and back before lunch. I would additionally propose the movie theatre test, which goes as follows: It’s now 6pm, and someone proposes to see a movie at 7pm. Is there still any way of (1) getting to the movie theatre in time (unlike shopping, a movie plays at a set time), and (2) getting home afterwards? That’s a good test. I once had to walk 12 km home from Albany because the buses stop at 9 on Sundays. Hmm, in hindsight I wasn’t very clear, what I meant was the destinations themselves, and the order I did them in weren’t based on anything other than looking at a map and picking the ones joined by thick lines. Totally agree that the no phone, time, Sunday etc. constraints are not only reasonable, but expected as a base service on any decent transit network. 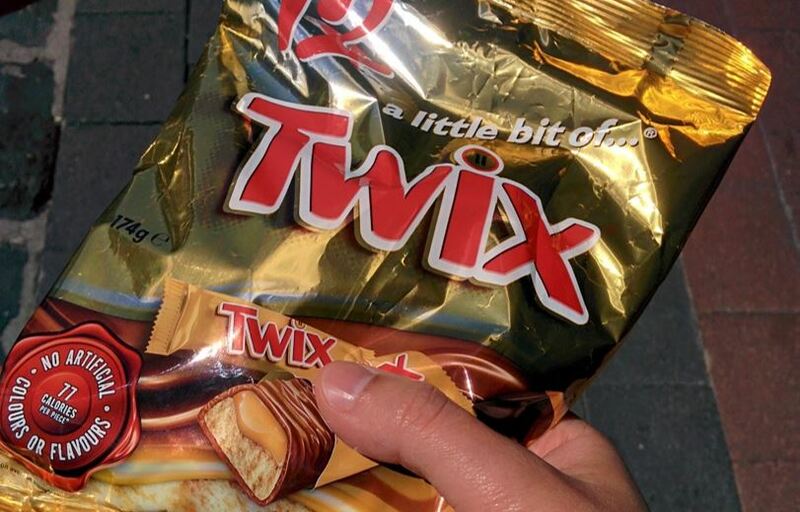 I was hugely impressed that I could do it. Felt like I was in another city for a bit. The movie test is interesting, as I do it every couple of weeks. Admittedly, I have a huge advantage due to pretty good Dom road buses being outside imax, but I suspect pretty much any other cinema would be annoying as hell, not least because of the way our PT tends to turn off at 7pm. Yes and hopefully, once this settles, on the longer term new shops will have a tendency to pop up near those thick lines. Right now it seems that apart from Sylvia Park, every shop in that area is at least a 20 minutes walk from any transit. I think our scribe has given the new network a pass? So far, so good. For me, yep, it was good. I think it’ll take a while for everyone else to get used to transfers. But it’ll do wonders for many people – didn’t see many on the network at all, which is quite different to many isthmus buses which are always busy, even on Sundays. I’d say that’s a largely function of poor frequency and impossible legibility in the South: it’s just too hard to do non-city trips and live a normal lifestyle, so people drive. NN gives us, in effect, a whole bunch of link buses connecting centres. Guessing off peak will grow, and lots. Superb work Shan. It’s the kind of thing AT needs to do a lot more of itself. Getting an unprepared or unfamiliar traveller to tackle journeys on its network, and see what works. I totally agreed to your points about the issues of otahuhu interchange. 1.There is no signage or wayfinding to show which bus goes to which platform. The only information is a small A4 paper sticking on the board near thr train platform. 2. The real time screen display has 5 pages and they scroll very slowly. The most revelant information is on the first page. I will have to wait a minute until the screen change back to page 1. Which is time wasting. They should redesign the layout to minimise pages scrolling. 3. There is no help desk on the station unlike northshore bus interchange. It took me a lot of time to find where to board the right bus. Exactly; infinitely better; options immediately available. Yup, seems to be AT’s standard that latest one at the top,even Britomart’s huge ones flick around when a train leaves which can be irritating when trying to read. 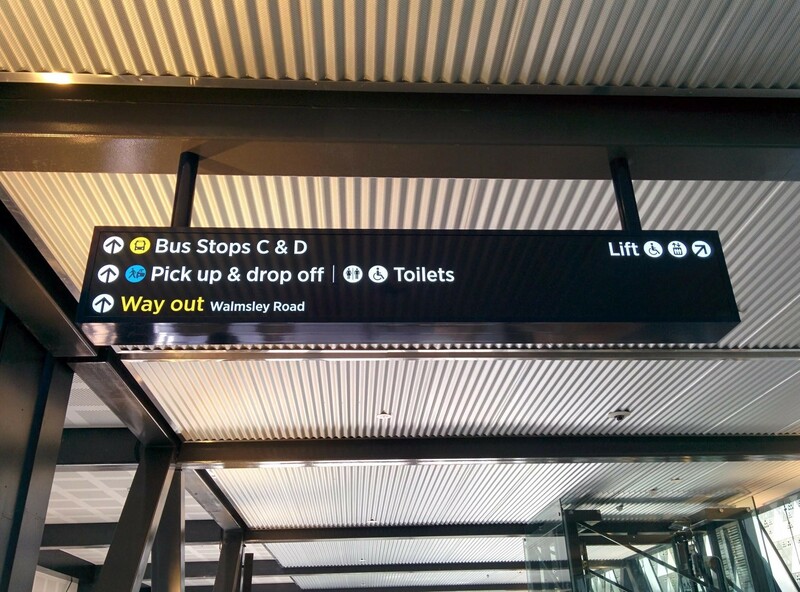 How about using the same PIDs as they have in Wellington? Do you have a sample pic of that, can’t find on the web? Why is it that AT seem to be determined on cutting back the late night services from the CBD? The last bus services from the CBD are at midnight, on selected routes. But no longer for south aucklanders. They now have to be out of downtown by the 22:28 southern line train service. That’s just pathetic. The last 33 bus service leaves Otahuhu station at midnight. But has no train service to meet it. It has been 13 years since the creation of Maxx in 2003. Still they refuse to implement train services that leave closer to midnight. It is going to be the same story for west auckland and the north shore when their new networks come into effect. But you can bet that the isthmus new network will retain their midnight services as they will get special treatment. Ah budgets. You are absolutely right, increasing the span of Transit services is a must. Is it seriously a budget thing? NEX and many buses throughout Auckland leave CBD as late as 23:00-00:00 Mon-Thurs and upto 03:00 on Fri-Sat nights (i.e. Sat-Sun mornings). Someone told me apparently it was something to do with the union not having TM’s work past 23:00 except on Fri-Sat night. The past two timetable changes I was eagerly awaiting later trains… but still nothing. I certainly hope later trains will come with the March 2017 timetable. Someone told you a load of sh#t then, TMs often work past 23:00 any day of the week. It would more likely be a security thing or line maintenance (nearly every night the power is isolated in different sections of the network for maintenance) as TMs work on test trains that routinely run on the network outside normal train operations. All March will bring you is 52 minute (down from 54) trips on the southern line (a little shorter on the skip station services) and peak time station skips on the Onehunga line (the Onehunga line is the latest one to be rumored as the only service stopping at Parnell). Well the last timetable change was supposed to have 15 min off peak according to the AT EMU improvements spreadsheet (posted in a TB article). So certainly the next one right? I hadn’t heard about the 15 minutes off peak but it is possible it will be included, with station skipping to free up train sets it doesn’t really mean a better service unless you are one of those that goes from the first station all the way to Brito. ahhh true, but they have a special weapon called the 322 bus that not many have noticed leaving after the trains stop earlier from Mon-Thurs….should match the 33 in Otahuhu. Scrolled past those two 322’s since it says peak only. Odd spot to put them. Still needs to better though. Yes not that obvious apart from on this document that I’ve seen: https://at.govt.nz/media/1971579/final-web-version-southern-new-network-brochure.pdf buried down in a tonne of other links, text and other documents on this page: https://at.govt.nz/projects-roadworks/new-public-transport-network/new-network-for-south-auckland/ I guess it was delivered to all southern households before 30th Oct? I picked a paper one up when at the opening of Otahuhu station, may have just been at these types of information events. Auckland Transport has never cared whatsoever about transfer penalty. I don’t think they’ll start now. While there are some areas where they have tried to make transfers easy, their timing is so bad that the bus waiting for transfers is forced to leave because the first bus was never going to make it in time. Being on an hourly frequency makes it extremely frustrating. Anything I ever read from Paul Mees stated that you must have a 20 min frequency or better to ensure transfer penalty doesnt exceed 10 minutes. When you look at the maps the very poor coverage by the frequent network suggests we`re still not that serious about PT being more than a service for the disadvantaged. How about less glory projects – such as Dominion Road LRT and far more OPEX spending to get frequencies up! It’s important to note that the New Network is the same number of buses, same resources and costs as the old network… its just much more efficient, but not “more”. Dominion isn’t necessarily a glory project, it would free up 30 buses an hour of capacity and opex costs to distribute elsewhere. 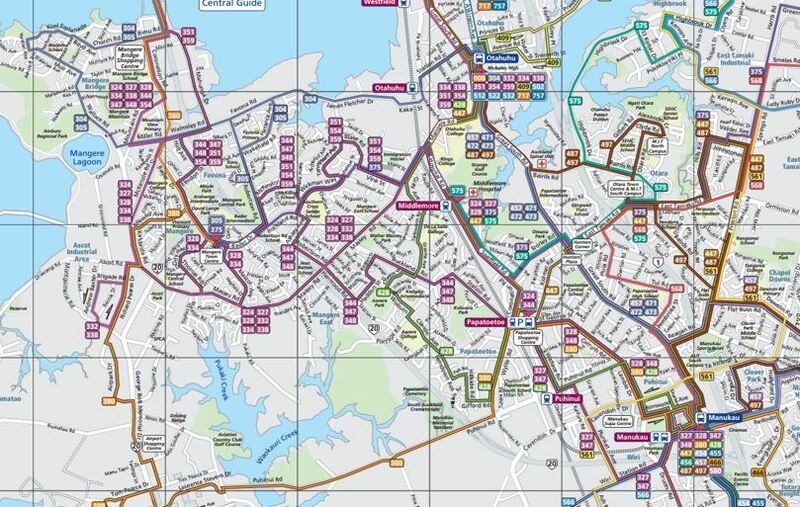 You could probably make a dozen average routes across the region into frequent routes, if you had the resources of the Dominion Rd corridor to spend on them. The confusion is understandable. The NN was initially designed to use the same resources that were currently being delivered, in terms of kms etc. The prices received in subsequent PTOM tendering, however, came in lower than the existing prices, which in turn meant AT have been able to run more kms. It’s good people want more frequent services; that’s exactly what you’d hope to see from the NN: A desire for the frequent services to be progressively expanded as and when budgets allow. There seems to be billions for CAPEX but never enough money for OPEX. One thing I noticed with the Southern new network is how out of sync feeder buses are with trains especially in the off peak. Peak isn’t too bad with my route (365) having 10 minute & 20 minute frequencies during peak then back to 30 minute in the off peak. I find the bus journey far more pleasant but once you get to the train station (Manurewa) you’re waiting for a considerable time before the train arrives. Not exactly the single transferable journey we want it to be. The people who designed Otahuhu station have not made it easy to get off a bus and then cross over to the lights to Station Rd. The path requires you to double back 20 meters rather than have a path direct to the lights.Or you can walk on the road and dodge the buses. Or walk over the garden. Or you can walk over the garden. I walked over the garden! Apologies to AT. Yes there’s a clear desire-line unmet there. I did the long way round on the open ceremony morning on my bike to access the bike racks. Wanted to take PT to Andre Rieu from Hunters Corner. No problem getting in, but no way back. Ended up taking car to Newmarket then bus. Kinda defeats the purpose. Papatoetoe – Otahuhu – Symonds street (Britomart). Excuse my essay but this is problem!!! For public transport patrons trying to get to Symonds street via the “new and improved” South Auckland network is HARD. I’ve been testing out various routes to and from Symonds street to Hunters corner Papatoetoe, and I am finding it extremely frustrating. Route 33 buses have been late even with their supposed increased frequency. It takes on average 15 minutes to get to Otahuhu from Hunters corner in traffic in the morning. Make it 20 minutes if you want go to Otathuhu station – Station road is a nightmare to get through traffic. Depending on which mode of transport you choose to transfer to, it takes an additional 45- 75 minutes to get to Symonds street. If you choose the 322 bus that takes a good 60 minutes via most of great south road (don’t forget the sight detour to go to Green lane train station). I haven’t even seen the alternative 321 bus service * I don’t believe they are operational. Alternatively you can take the train (if they are working of course), it takes 30 minutes from Otahuhu to Britomart and then a bus ride down to Symonds street – provided you don’t miss the 277 or 247 or anything else – that’s another 10-15 minutes. Total journey time = 1 hour 10 minutes –to- 1 hour and 30 minutes on average. Less than a month ago, South Aucklander’s were able to take magical unicorns called express buses (routes 457x and 471x to be exact) that would go via southern motorway – total journey time 20 – 40 minutes depending on traffic – slightly off peak times. Main point, how is going from 40 minutes total journey time to 1 hour 20 minutes each way better? Bring back the express routes and give us more 322 and 321 buses – once your connection has been missed it’s a good 30 minute wait. All I am doing is wasting time. I hate to think what will happen when university semesters return – UOA and AUT students are in for a shock trying to come in. Thanks for excluding South Auckland. 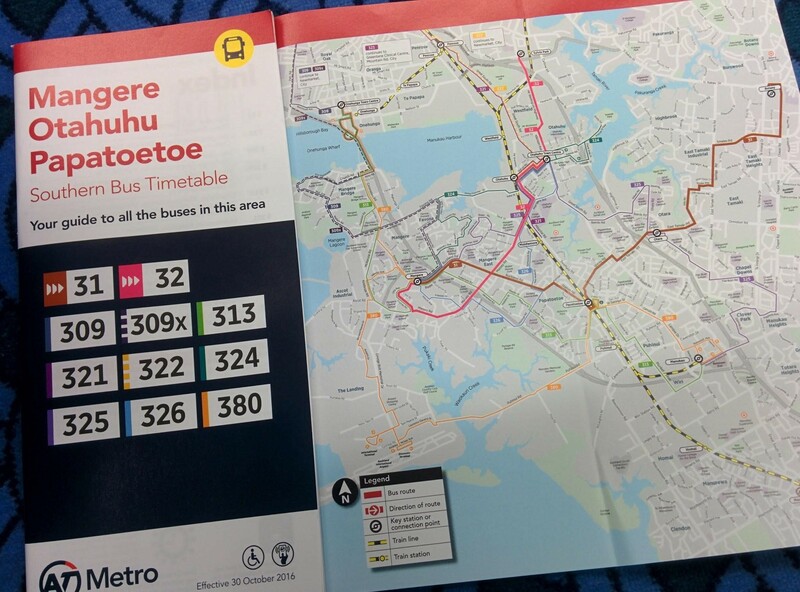 1) Try catching the 31 to Papatoetoe instead if possible. 2) Try getting off of the train at Newmarket instead, especially if you are further up Symonds and catching a bus down the hill instead. 3) If you continue to use Britomart, leave through the eastern end and walk to the bottom of Anzac Avenue instead as there are far more buses using that stop (277,274,881,550,551,625). Those (especially 3) will really reduce travel time for you. The reason it is better for people travelling off peak to Symonds Street to have a slightly longer journey is that the enormous majority of trips are now far quicker, you are the unfortunate 1-2% who are worse off so everyone else can be better off. “If you choose the 322 bus that takes a good 60 minutes via most of great south road”, yes I would definitely head for the train closest to you, that’s the whole idea and miss the traffic and 5 million bus stops along the way. The train has it’s own right of way & more quality travel style… Regardless, your journey time should be a lot more predictable..the motorways are very sensitive to accidents/breakdowns remember…unless the trains are out of course,which is getting rarer now. One thing that amazes me is that no buses (380 excluded) go via Manukau City anymore. Instead one has to take an stroll from station to the back end of the Mall. Is that retaliation for Westfield’s refusal to allow the Manukau Station to be built contiguous to the Mall? It looks to me like the buses do in fact go through Manukau City. Luckliy AT have recognised that an empty parking lot and mall are not the centre of Manukau. Just a quick note about success story from the South: A relation who has used PT quite a bit and was loathing the thought change in the new system and of transferring was very impressed on their first trip from Mangere Bridge to MIT. What used to be an hourly bus near home was 1/2 hrly and transferring to the frequent 31 at Mangere was a breeze with a 1 min wait for it right outside the MIT campus. They were also impressed by the new buses & USB charging etc which they didn’t realise would be the case. Moving from the train platform to the bus bit was interesting because it seemed to be utterly deserted (apart from a couple of people waiting for their bus). The overhead screens didn’t have platforms displayed and I couldn’t see any maps (e.g. mounted on the wall) or physical timetables… but this may have been because I was trying to get a long enough look at the screen with some information about buses. I gave up and decided to see if I could find someone. In the end I made my destination on time but this was entirely coincidental as the bus that turned up as I was heading downstairs was a 321… i.e. the kind of bus I was intending on catching to Britomart from Gillies Ave once I’d wrapped up where I was going initially. Maybe it’s my fault and I didn’t see what was there, but it seems like there should be more than just those somewhat dodgy screens.